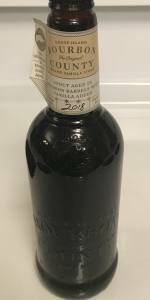 Bourbon County Brand Vanilla Stout | Goose Island Beer Co. Bourbon County Brand Stout spiced with fresh vanilla beans. Served from a bottle at the DC Goose Island Migration Event, at both Churchkey and Meridian Pint. A: Black as night, like every stout ever made. Imposing. Very thin mocha head. Great lacing. S: Ridiculous. Mellow vanilla notes, BCBS bourbon notes, incredibly complex. Maple? Smells like Utopias from the bottle. T: OMFG. Have you even had BCBS? I want you to take that incredible flavor you know and love, but you know that kind of sweet imbalance that happens at the end of regular, fresh BCBS? I want you to imagine pillow-y vanilla/marshmallow flavors picking you up, balancing everything out, and carrying you off into vanilla Wonderland. M: Thick, chewy, ridiculous. Everything you love about Bourbon County, and everything that makes you wonder "how do they make a beer taste and feel like this?" O: I never thought I would have this beer, and between the two DC events, I had almost a full 22oz bottle to myself. I couldn't stop ordering it. This is the best beer I've ever had. Bar none. I've had every single BCBS variant, including Rare. This blows them all away. I hope I get to have it again someday. I don't want to be that guy, but seriously: give up on trying to find a bottle of Rare for yourself and track this down. I had King Henry alongside this beer, and it made KH taste thin and diminished its bourbon flavors. In fact, there were four of us, and everyone agreed: better than Rare, better than KH, better than Bramble/Cherry Rye/Coffee. Unbelievable, 5/5, my only perfect review. At a Bourbon County tasting, this was my favorite of the bunch, including Rare. This beer is very much Bourbon County, but with a smooth flavor. What vanilla does is it adds some sweetness and rounding flavor, which in generally compliments the beer instead of being a prominent flavor. On the finish, you push towards a vanilla sweetness. The beer is still drinking extremely well. Tasted from 10 year old bottle. Pours black with slight dark brown head. Awesome complex aroma and taste. Nose of bourbon and vanilla. Thick and chewy mouthfeel. No boozy notes at all. Flavors of caramel, molasses, bourbon, cocoa, and nice vanilla but not overpowering. Hands down one of the best beers I’ve ever had. The appearance is black, no frills here. Not even any head. Only a thin ring forms even after a moderate center pour. The aroma is big vanilla up front followed by chocolate, bourbon, and an essence of sweetness. As it warms the bourbon falls off in the scent and gives way to more sweetness. The taste is spectacular, following the nose exactly but amplifying it very tastefully and not overdone. The flavors all blend together expertly. Vanilla begins the symphony but gives way quickly to decadent, rich, sweet chocolate. Bourbon darts in and out quickly flashing between the chocolate and fudge brownie. The finish is vanilla and chocolate sweetness. Mouthfeel is slick and creamy, but never chewy or overwhelming but fuller than medium. Overall this is fantastic, 10/10 would recommend. Had on tap. So when I reviewed the vanilla rye variant, my only qualm was the power of the vanilla overtone as the beer warmed up. Here it doesn't need to warm up, no nuance whatsoever. It is like someone dumped too much vanilla extract in my glass. Not a lot of balance with other flavors besides booze, malt, and chocolate. Sure it is good, but nothing legendary. Criminally overrated. Figured I'd do something special. I've been saving this for an occasion. It's Christmas day, and it's my 100th review. So here we go. Pours a deep, inky brown, and sits as black as night in the glass. Zero light penetration, and just a sliver of a mahogany halo. An aggressive pour yields a bubbly, super dark brown head, that never even has time to build. Gone in a flash. Nose is that BCBS chocolate syrup, with a whole bottle of Madagascar vanilla extract. A really pure, organic vanilla note. This is fresh, sticky vanilla beans. I'm getting typical BCBS barrel notes, dark fruit, chocolate, etc...but with a big fistful of vanilla beans, and a good little booze burn. Loving the vanilla on the nose. Palate is surprisingly chocolate-forward, perhaps even more so than regular BCBS. There is a lot of barrel presence on the palate, and I like that a lot. I'm getting a really nice bourbon note. Chocolate syrup, whiskey, dried figs, plum, cherries, currant, oak, and then some heat. The idea of vanilla is present the entire time, but it's around the finish where it really shows its face. With a nice sense of closure, the floral vanilla note the hay was so gorgeous on the nose, returns on the finish and reminds you that it's still very much there. The vanilla extract flavor lingers long, outliving any roasted malt, barrel char, or other long lasting finish flavors. A gently fading backdrop of vanilla beans. Mouthfeel is just a few prickles away from being flat. It's incredibly thick, slick, viscous and soft. The consistency of a very fine olive oil with some bubbles. Thick, rich, big, soft, and bold. The way a stout like this should feel. Absolutely zero complaints in the feel department. Overall, I don't think you could really want any more from this. More vanilla, and people would be complaining that it "overpowers" the beer. Any less, and peiple would be complaining there isn't enough. I think Goose Island did a fantastic job of finding balance between the base beer, and the addition of vanilla beans. This is not a flavored beer. This is straight up BCBS aged on real vanilla beans - that'd very evident from the taste. I have no complaints about this beer, other than the exorbitant cost. $20 (my neck of the woods) is rather steep for ANY beer of this size. Is it worth it? Yeah, I think so, but man, if it were a little bit cheaper, that would be amazing. I am not calculating cost into my rating. You shouldn't do that. I'm only pointing out that this isn't cheap, and that other than that, I find no fault with it. A true celebratory beer on this celebratory day, and I could not be more please to make this my 100th review. Thank you Goose Island for making such amazing barrel-aged stouts. BCBS is the gold standard of them all, and this vanilla variation does not disappoint. Cheers! Appearance: Dark black, opaque. Ample head with good retention. It looked creamy when poured into the glass. It caused anticipation to build for the first smell/taste. It’s one of those beers where you can just tell it’s going to be good just from the appearance. Smell: Rich malts, chocolate, dark fruits, bourbon, and alcohol with the vanilla shining through. At 13+% ABV you can’t hide the alcohol but there is a host of fragrances that come through. The anticipation builds. It is a VERY inviting brew. Taste: BINGO!!! Game over! The Holy Grail has been found! WOW!! This did not disappoint, in fact it exceeded all I’ve heard about it. You taste alcohol but not overpowering. There is sweetness but not cloying so. A perfect balance IMHO. This beer does it for me. The bottle was removed from the fridge and allowed to warm for an hour before tasting. This allowed the vanilla to really stand out. Mouthfeel: Creamy coating that lasts throughout. Just adds to the pleasure. Overall: As I said, GAME OVER!! It has been found. It’s #1 in its class so far. I haven’t given a perfect 5.0 rating to anything because I figure I haven’t found it yet and don’t know what’s around the corner, but this is as close to perfection that I have found so far. Do yourself a favor; if you like stouts… seek this beer out. You won’t be disappointed. NOTE: I've only had this one bottle of Vanilla but it's still there and not breaking down. I've had the regular black label, the coffee (2 or 3 years), the Backyard Rye, Proprietor's, and Rare but this one is a personal favorite of mine. Even more so than the Rare. L - Pitch, opaque black with a thin dark tan head (slightly darker than the original BCBS) that sticks around for just a little while longer than the original stout but dissipates completely eventually and leaves behind no lacing. T - Follows the nose: rich, sweet vanilla up front and throughout - at times it tastes like marshmallow, at times like vanilla ice cream - quickly followed by rich chocolate - more milk chocolate than dark chocolate like in the original - and sweet bourbon as well as toffee, dark fruits, raisin, slight oak. Picked up a 500 ml bottle today 11-23-18 at the Craft Beer Quick Stop for $24.99. Bottled on 9-4-18; 14.9% ABV. Beer poured black as night into the 8 oz BC snifter given out as part of the event. Head was tan and smallish, dissipating quickly. Nose is very nice, vanilla and toffee forward with some bourbon lingering in the background. Taste is near perfect starting off as toffee and vanilla forward forming a coffee flavor with the roasted malt base. Bourbon and leather appear with a warming alcohol finish with each sip. Mouthfeel is medium bodied and very smooth. Overall a very nice flavorful sipper to be enjoyed on nice crisp fall and winter days. Glad i got to try! Cool thing is i have two more waiting in the wings to see how it ages over the next year. I woke up today with a dry throat. The damn ceiling fan, which I rely on to block out noise and keep me cool, had attacked me by confiscating all signs of moisture in my entire respiratory system overnight. I was thirsty. But I had no clue how much my thirst was about to be quenched. This was the first beer I had today. It was the last beer I had today. It was the best beer I've had in a long time. Overall, I'd say I had 22oz or so, and, let me tell you, this beer delivers. Appears a magnificent black, the kind of black the Rolling Stones sang about painting things. No head whatsoever, and a ton of alcohol sticks to the side of the glass when I swish. Smell takes me somewhere. Grandma is baking vanilla cookies. Grandpa is sipping his bourbon. And I'm eating a chocolate candy while my olfactory tingles with delight. Taste is perfect. A strange combo of coconut, vanilla bean, oak, bourbon, chocolate and caramel tastes more defined and well balanced than any desert I've had. This is exceptional in terms of its depth, extreme flavor, and ability to define different elements in unique flavor spikes along the journey. Honestly, one of the best beers I've ever had. Mouthfeel is thin, but this may be a result of the cask feel. The carb isn't an issue, appropriate for the serving type. Drinkability is well above many in the field. Strong? Sure, but this is a magnificent example of when imperial flavor is necessary to achieve such a magnificent result. Kev and John at the Lizard, you have outdone yourselves this year. This was just fantastic, and I want to thank you for a wonderful event and a new top 20 beer for me. Tonight, I will sleep with the fan on. And it can't do a thing to make me uncomfortable. Try as it might, it shall not rob me of this - my thirst has been quenched for a while. A: Appears black and viscous, though the edges show a deep mahogany brown color. Forms a large foamy, dark pastel brown colored head that dissipates to nothingness, not even a hint of surface coating. No lacing. S: Sweet dark chocolate, cocoa, figs, bourbon booziness and some light vanilla. Rather complex. T: A rather complex, but overly sweet blend of chocolate, brown sugar, figs, prunes, deep roasted malts (with only the slightest bit of char) licorice, and vanilla. Finishes with sweet bourbon and a hint of alcohol. M: Full bodied with a smooth satiny texture. D: In all honesty, this tastes like BCS with an extra nudge of vanilla. Not sure why I was expecting something more, but I did think the vanilla would be a bit more pronounced. And just slightly too sweet for my tastes. Never the less, a very good beer. On tap, pours a deep black with an off-white head. Smells like BCBS with maybe a touch more vanilla. A little less rich than regular BCBS. Really good, but not a particular improvement on the base beer. Bourbon County Brand Vanilla Stout from Goose Island Beer Co.